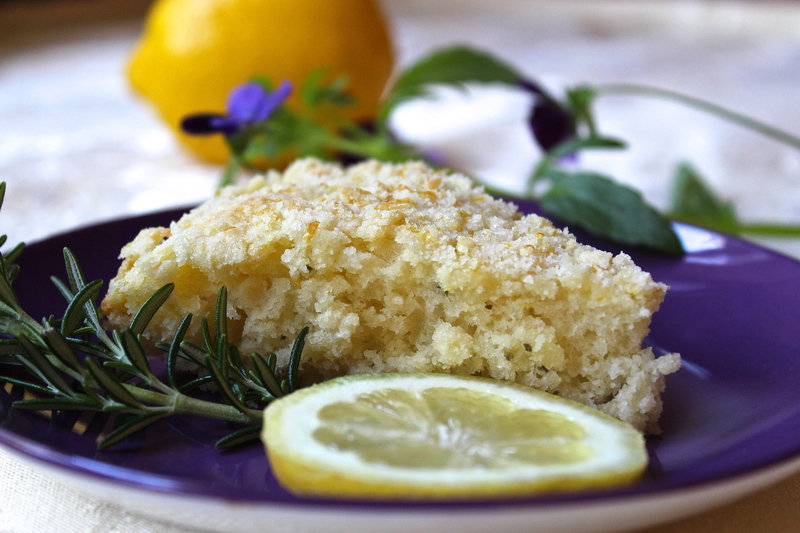 Lemon-Rosemary Crumb Cake | What about this? The strong flavors of rosemary and lemon can oftentimes dominate a recipe. Not so, in this case. From the crunchy lemon crumb on top to the tender cake speckled with bits of rosemary, this cake is delightful from top to bottom. With its perfect blend of flavors and its ease of preparation, it will quickly become one of your “go to” cakes. Serve it for breakfast, brunch, lunch, snack, or dessert! 2. Lightly spoon flour into dry measuring cups; level with a knife. Combine flour, sugar, and salt in a bowl; cut in butter with a pastry blender or 2 knives until mixture resembles coarse meal. Reserve 1/2 cup flour mixture for topping; set aside. 3. Combine remaining flour mixture, rosemary, baking powder, and baking soda; add buttermilk, lemon juice, and egg. Beat at medium speed of a mixer until blended. Spoon batter into and 8-inch round cake pan coated with cooking spray. Combine reserved 1/2 cup flour mixture, lemon rind, and water; stir with a fork. Sprinkle crumb mixture over batter. Bake at 350 degrees for 30 minutes. Cool on a wire rack. Garnish with rosemary sprigs and lemon slices, if desired. 1. I used butter instead of margarine. Why not splurge on flavor since the recipe only calls for a 1/4 cup of it? 2. I only have a 9-inch cake pan, so the cake would have been taller if I had used an 8-inch cake pan. 3. Using the larger pan, I was careful to check the cake after 20 minutes. It was baked by 25 minutes. 4. To test the cake to see if it is done, gently press on the top of it with your fingers. If it springs back completely when lightly touched in the center, the cake is done.